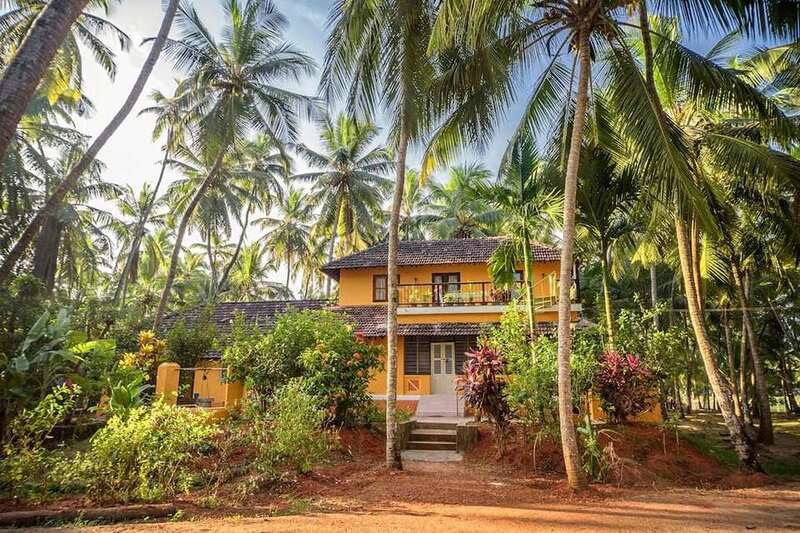 From beaches to desert, and historical to contemporary design, we've uncovered the coolest houses you can rent in India. They're no ordinary houses either. They include a mud house, a house made from shipping containers and a tree house. Your vacation is sure to be a memorable one! Cool Quotient: Set on a private river island. 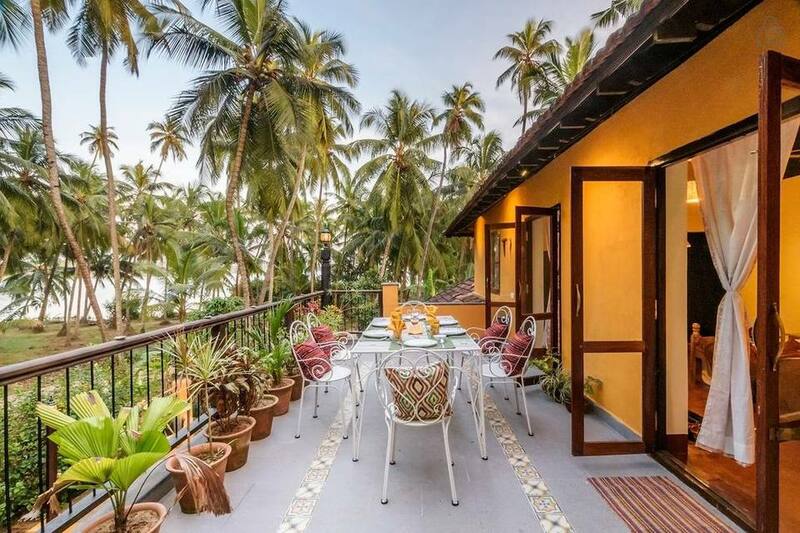 Perfect for a romantic vacation, you can't get more secluded than this house on an island on the Suvarna River in Karnataka's Udupi district. It's surrounded by coconut palms on three sides, fronts the river, and has a deck with stunning views. Such paradise! The onsite cook and caretaker will look after all your needs, including preparing delicious Mangalorean-style meals. Mangalore is just over an hour away. Bedrooms: Three (one with balcony on the upper level, and two basic small ones on the lower level). Cost: 9,000 rupees ($130) per night for the whole house/five people. 4,500 rupees per night ($65) for two people. Cool Quotient: An authentic sandstone heritage haveli (mansion). Newly renovated by a Frenchman and two locals, this house has been beautifully decorated with Rajasthani arts and crafts reflecting the culture of the region. It's situated at the base of Jaisalmer fort, less than 10 minutes walk from the entrance. Salim Singh Ki Haveli, one of the most famous havelis built by a former prime minister of Jaisalmer, is a few minutes walk away. Cost: 9,000 rupees ($130) per night for the whole house. Rooms can be rented individually for 6,500 rupees ($92) per night. Breakfast and dinner are included in the rate. Cool Quotient: Made out of mud and provides an experience of nature living. About an hour from Munnar, this eco-friendly mud house is surrounded by sandalwood forest and is most suited to those searching for tranquility. The interiors are rustic yet chic with partially open-air bathrooms. Home cooked meals are provided by the caretaker and bicycles are available for hire. You'll leave feeling refreshed and rejuvenated! Cost: 5,900 rupees ($85) per night for the whole house. Cool Quotient: A luxury tree house to revive childhood memories. This airy tree house sits in a cashew and mango orchard near hip Ashwem beach in north Goa. It's one of a string of fashionable properties created by an Indian creative director turned social entrepreneur, and his Scandinavian partner who's an interior designer. Two of them (Shunya Eco Bungalow and Shunya Kaju Varo Villa) are next to the tree house and can all be rented together. They have a shared swimming pool and outdoor barbecue dining area. Cost: From 7,380 rupees ($105) per night for the whole house. Cool Quotient: Its living room has a glass roof. You can dine under the stars. Looking for a serene mountain getaway? This cozy boutique cottage is like a breath of fresh air! It's been built in traditional style out of reclaimed teak and oak wood. Yet, it has plenty of modern touches such as Scandinavian light fixtures, customized furniture by a Delhi design studio, and contemporary wall art. It has its own monogrammed linen too. A viewing deck and apple orchard add to the appeal. Cost: 14,000 rupees ($200) per night for the whole house. Individual rooms can be rented separately. Cool Quotient: Made out of repurposed shipping containers. The Black Box is totally "out of the box"! This modern industrial-design home is located at the Red Earth Riding School in India's spiritual Auroville community, near Pondicherry. This makes it ideal for those interested in horse riding holiday. However, also provides a peaceful escape from the city. You can bring your pets too! Inside, the bedrooms are decorated with industrial light fixtures made from pipes. There's a kitchen, outdoor lounge and dining area, and plenty of activities on offer. These include yoga, surfing, cooking, reflexology and Ayurvedic massage (if you don't feel like being active). Cost: 5,200 rupees ($75) per night for the whole house. Cool Quotient: Set on an organic tea and coffee plantation. Part of Oland Plantation (listed by Conde-Nast as one of the top 30 eco-resorts in India and top 10 plantation stays in India), Hornbill House is architecturally designed to maximise the views with deck overlooking the valley and tea gardens. It's particularly stunning during the monsoon season, when there's waterfall right next to the house. Birdwatching and hiking are popular activities. Do note that the dining area is located in the main estate house, five minutes walk away. Cost: 10,000 rupees ($145) per night for the whole house. Cool Quotient: A cute cottage right on the beach. Just steps from the ocean on Serenity Beach (10 minutes drive from Pondicherry), Casa Lakshmi is the ultimate budget seaside escape. You'll be lulled to sleep by the sound of the waves and treated to a glorious sunrise, which you can admire right from your bed. The bedroom's floor-to-ceiling glass windows open out onto an ocean-fronting balcony, providing dreamy views. The house has a kitchen but there's also a great restaurant next door. Cost: 2,999 rupees ($45) per night for the whole house. Cool Quotient: A 200 year-old former jungle hunting lodge amid a private forest. Shikar Oudi forms part of a 150 hectare estate given to the owner's ancestors for leading the Mewars of Udaipur to victory against the Mughals in war. It's been converted into a luxury property and is ideal for anyone who loves the great outdoors. The house overlooks a private lake about an hour east of Udaipur. Possible activities include jungle walks, wildlife watching, boating, fishing, tree planting, and visits to local village communities. Cost: 17,000 rupees ($375) per night for the whole house. The rate is less for only two guests. Breakfast is included. Cool Quotient: Is an ode to Bengali heritage. This mud house property is located in Noble Laureate poet Rabindranath Tagore's birthplace, Shantiniketan, about four hours northwest of Kolkata. The town is renowned for its culture, handicrafts, and visual arts. And, the house is the perfect place to stay and soak up its atmosphere. The property is decorated with Shantiniketan art and surrounded by garden. The dining room is a glass enclosure in the garden. For the best experience, visit during the Poush Mela (usually in late December), with its live Bengali folk music, or Holi (celebrated as Basanta Utsav). A village market is held there every Saturday as well. Bedrooms: Five, spread across three villas. Cost: 14,000 rupees ($200) per night for the whole property. Breakfast is included. Cool Quotient: Designed by the owners, and built with local stone and reclaimed wood. Life is indeed beautiful at La Belle Vie. This trendy rustic-style house, which has been featured in Good Housekeeping magazine, is the product of its owners' heartfelt artistic expression. They even designed and made the dining table! Nature-lovers will appreciate the surrounding walking trails and forest. If you think Nainital is too crowded these days, you don't have to worry. The house is located in a peaceful area near Naukuchiatal Lake. Cost: 12,000 rupees ($175) per night for the whole house. Individual rooms can be rented separately. Cool Quotient: The bedrooms are an enormous 730 square feet each, and the main one opens out onto a patio and koi pond. One of Goa's best private villas, Summertime is only 10 minutes from busy Calangute beach but it feels like a world away. The owners (she's Indian and he's Dutch) built the house with love and care to possibly retire in, so it has every comfort imaginable and more. They run a travel business and each item of furniture that they've collected has a story behind it. Not surprisingly, the villa was awarded Asia's Most Romantic Boutique Retreat 2016 in the World Boutique Hotel Awards. What's more, the owners have a luxury yacht and guests get a 25% discount. Bedrooms: Three, spread over two levels. Cost: 33,480 rupees ($480) per night for the whole house. Cool Quotient: It sits beside Vembanad Lake on the Kerala Backwaters, and is a contemporary interpretation of traditional Kerala architecture. Enjoy a quiet stay along the Kerala Backwaters at this gorgeous environmentally-friendly villa, built using recycled materials. The owners are passionate about green living, and rain water harvesting and an organic garden are some of the sustainable features of the property. It has been archetecturally designed to provide lake views from every room. The swimming pool is the highlight though! There are many indoor and outdoor spaces where you can chill as well, and watch houseboats passing by. The live-in care taker makes sumptuous Syrian Christian cuisine using incredients from the garden. Cost: 15,000 rupees ($215) per night for the whole house. Cool Quotient: The infinity pool and view overlooking Pawna Lake are superb. This stunning, luxurious contemporary villa is nestled into the lush hillside a few hours from Mumbai. It's split into two parts, with the more private lower part having a single bedroom that opens out into a deck with infinity swimming pool and Jacuzzi. If you can bear to tear yourself away from the villa, it's possible to trek to Tung Fort behind the property or go on a picnic by the lake. Cost: 58,000 rupees ($835) per night for the whole house. Individual rooms can be rented separately. All meals are included.